Depth can be an important part of your frame display. Whether you’re layering frames and mats for visual impact or framing a thicker item, knowing the depth you need is paramount. Recently, we received this question from a customer regarding framing canvas. I'd like to purchase a wood frame to fit an oil painting on canvas. Painting is stretched on wood support stretcher boards 20 x 20 with a 7/8" thickness. Before placing my online order, I'd like to verify the thickness of inside frame - the place where the canvas will sit inside the frame. The website tells me that width and height will be 20 inches, but not the thickness. When I mount the framed painting on the wall, I don't want the frame to float away from the wall (half-inch or so) because the canvas support boards stick out beyond edge of the wood frame. I'd like the thickness of the canvas support boards to be flush with the thickness or back of the frame. Here’s how to ensure you’re ordering the right size frame for your canvas. First, measure the depth of the canvas you’d like to frame. Once you have that measurement, click the frame you’re considering to go to the frame description page. Now, compare the canvas depth measurement to the “R” measurement, or the rabbet depth, as listed on the left side of the frame description page. The rabbet depth measurement indicates much it can hold, so you know how thick your art stack can be. As long as the rabbet and the canvas are the same size, the piece will be flush to the back of the frame. If the rabbet is larger than the canvas, it will recess in the frame. 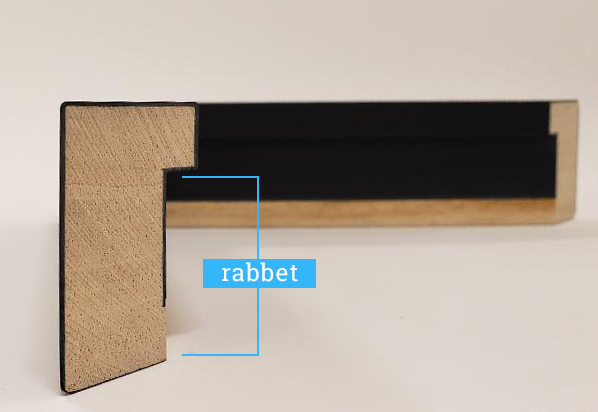 You’ll want to make sure that the rabbet isn’t smaller than your frame. This will cause the piece to stick out of the back of the frame making it difficult to secure in the frame or hang on a wall. Have more questions about frame depth? Our customer service team is ready to answer them. Contact us. I always like to have my canvas flush with the top of the frame but now I'm thinking about trying it so that it is recessed in the frame a little bit. Is there a specific space I should have between the canvas and the top of the frame that would look more appealing? This lesson is great for me. I will learn it for sure. Try paper outline service later on.